The ICMA Centre manages a very successful alumni community around the world. To date, over 4,000 students have graduated from our MSc and BSc programmes and are now pursuing successful careers with leading financial centres worldwide. Take advantage of the career development service. 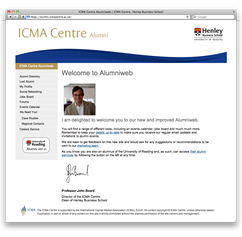 Log-In to the ICMA Centre’s new alumniweb website. If you have already registered on the University of Reading alumni site, your log in to the ICMA Centre alumni website will be he same. If you have been using our old site, available here, we would encourage you to register on the new site as we will be turning off the old site by the end of May. We also have a Linkedin group for all our ICMA Centre alumni, and our facebook page is also a good place to keep in touch with us. We would love to receive some more case studies from our alumni; if you would like to provide us with a case study regarding your time here and your career since please complete the Alumni Case Study Form online and email a recent photograph to our marketing team on marketing@icmacentre.ac.uk. The Henley Finance Special Interest Group is currently in the process of being established. The club’s aim will be to promote finance related activities and careers development events for Henley Business School alumni and associates. This group is in addition to the Centre’s current alumni services, communications and events and could provide you with some great contacts. The Club aims to further enhance our relationship with alumni, keep alumni up to date with current finance developments in industry and within Henley Business School. For more information visit our Henley Finance Club page. ICMA Centre alumni will be welcome and encouraged to join the Club. If you are interested, please contact alumni@henley.ac.uk. The ICMA Centre is one of the best schools for specialised finance, with in-house Bloomberg and Thomson Reuters terminals forming an integral part of the excellent infrastructure offered.